Bring the Spring | TOMMY LINK INC.
We survived February. I’m not sure how, but here we are. Four weeks of temperatures between 0 and 30 and back to 0, with every type of precipation and weather related mishap worth mentioning (vehicle repair, gigs canceled due to illness, the works). But here we are! It’s March and we live and breath, and of the many things to do this fine month, the first and foremost is the thing to talk about. The Strangers and Liars CD release party! After months of work, the new disc is set to spin. March 8th, from nine to midnight, The Kings Rook Club will be hosting our CD release party. With all the excitement, there’s noth much else to say about it. If you can’t be there, get a copy of the CD on itunes, CD baby or bandcamp and let “Live That Way” speak for itself. A few other gigs to mention for the month. At he end of the month (Friday, March 29th) we’ll be back at the King’s Rook as part of a benefit show for epilepsy. Also included on the bill, Breaking the Circle, Basket Eddy, Special Guest and Scarlet Ledbetter. 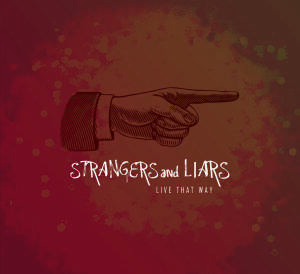 Strangers and Liars will also be returning to the Crossroads Dinor on Marh 22nd for another show. It’s all about the new! New month, new CD, new t shirts (did I mention the new t-shirts? ), new opportunities! Bring on the spring!